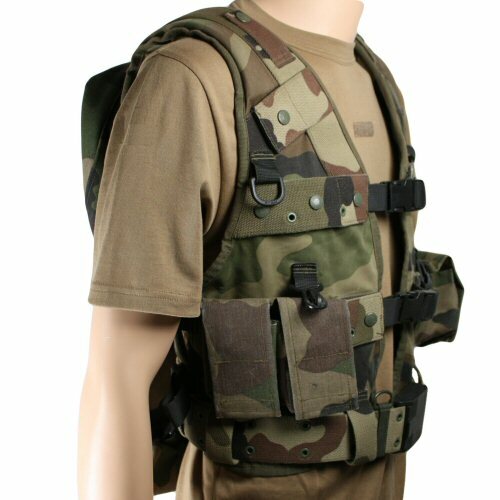 The French tactical combat assault vest is a military issue vest in CCE camo as issued to French infantry and foreign legion forces up until the introduction of MOLLE type body armour systems. 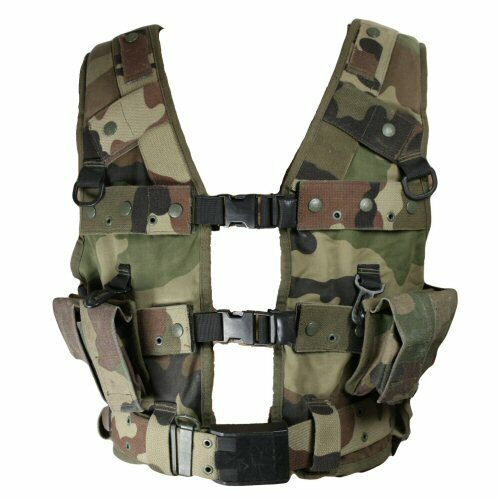 The vest is fully modular with a velcro, button and strap system on chest and under the ribs for attachment of pouches on the front. By lifting the 50mm wide straps, pouches can be inserted and positioned in place by buttoning down the straps, so that any pouches which are able to fit onto a 50mm wide belt will be able to fit with the system. D rings and hooks are positioned to help prevent sagging of loaded pouches on the vest material. The front of the vest also closes on the front with two side release plastic buckles, positioned next to the pouch attachment strapping. 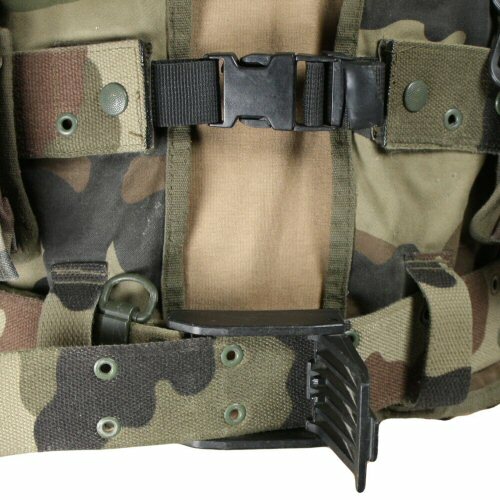 Along the bottom of the vest are belt loops, which accept a 50mm wide duty belt. The belt is included with the vest and is adjustable for length and closed with a wide and tough cam buckle. The shoulders of the vest feature integrated padding to help distribute the load weight. 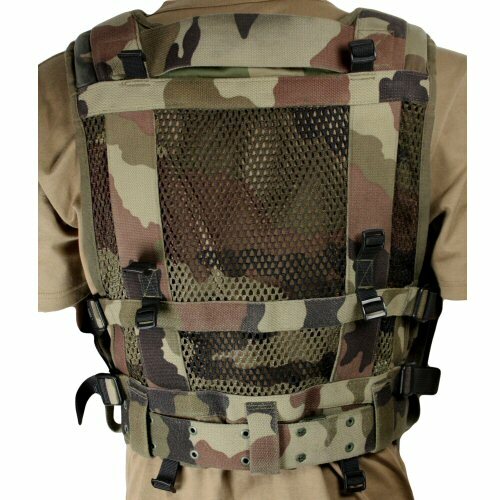 The rear of the vest has a wide carry handle and is strengthened with 50mm strapping running down the stress points. The back of the vest is made from wide mesh for ventilation. There are two sets of low profile rectangular rings situated on the back of the vest, and these are mounting points for the large utility day sacks. These are approximately 25cm wide, 20cm tall and up to 10cm deep each, and zip open. In order to remove one or both day sacks, the rectangular rings on the sack should be manipulated through the rings on the vest. 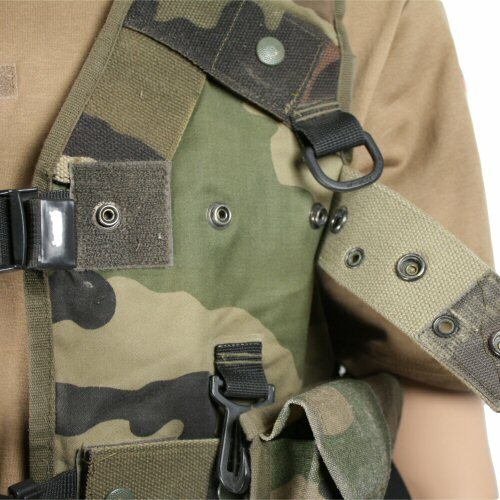 All parts of the vest, excluding the black plastic buckles and parts, are colour coordinated in French CCE camo. 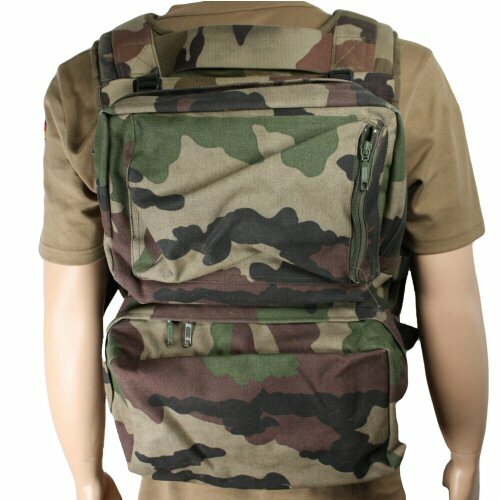 The set comes with two CCE camo utility pouches which open with velcro lids. Side view of the vest set. The rear with the daypacks mounted on the back. Each daypack opens with zipper. When the daypacks are removed, the back is meshed for ventilation. The front of the belt buckle is a heavy 50mm wide cam buckle which can be adjusted without the need for specific adjustment points. The modular strap, button and velcro system can be used to fit any pouch which is designed to fit on a 50mm wide belt.